Northeast to Florida and westward. Flowers: growing loosely in varying numbers on a long scape. The flower has a peculiar expression, as though it were upside down, owing to the ovary being untwisted; and the lip remaining on the upper instead of the lower side of the blossom. The lip is most delicately bearded with white and yellow. Leaves: linear; grass-like; nerved and sheathed near the base of the scape. Scape: rising erect from a bulb. 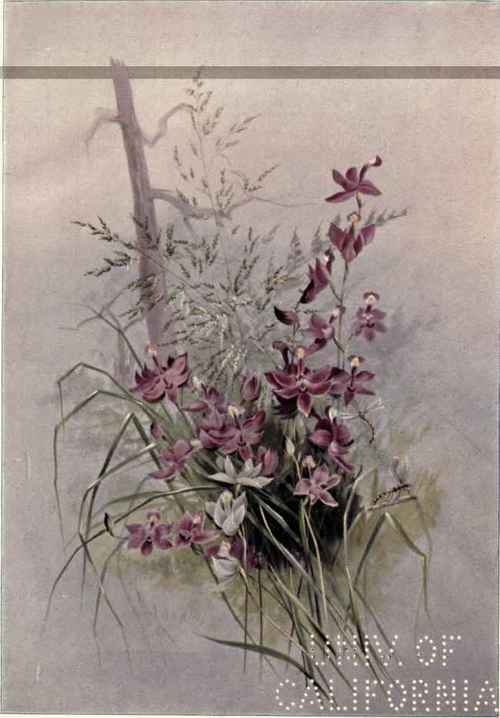 We have no wild flower that is more patrician in its bearing than this handsome orchid. It suggests a high-bred individual with a taste for the eccentric who calmly persists in wearing his beard upside clown. But its colouring is so regal, and its beard so very beautiful that we cannot wonder at its not conforming to fashion; which would certainly rob it of much of its unique bearing. Neither has this whim been allowed to interfere in any way with the domestic arrangements of the flower. In most orchids the lower lip is brought under, so as to form a resting place for Master Bee; as they are designed for insect fertilization. Not to offend by this omission, our lovely flower has one of the coloured sepals brought forward; which suits the undiscriminating taste of its visitors quite as well. 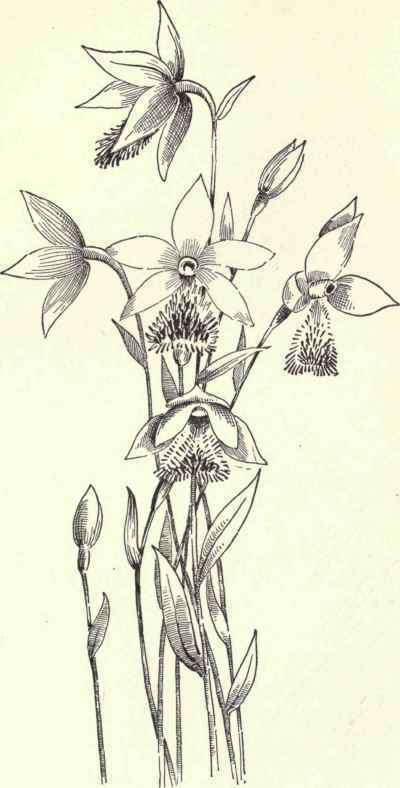 The flowers from which the accompanying plate was painted, were very little less than two inches broad. The plant is not nearly so rare as it is generally thought to be, and well repays the time spent in its quest. Pale pink, or greenish white. Flowers: terminal; solitary; having the six unequal divisions of the perianth that are peculiar to the orchid family. The lower lip bearded and fringed. Leaves: ovate-elliptical; one wrapped midway about each stem; smaller bract-like leaves at the base of the flowers. Flower-stalk: erect from a bulb. Why call this flower by such a name That makes it blush as though in shame ? A snake is e'er a frightful thing, Whose mouth gives forth a deadly sting; While naught but sweetness ever blows From where this tranquil flower grows. To those that think of an orchis simply as an aerial thing hanging in a greenhouse, it seems almost incredible that this modest plant should be a member of the same family. But if studied carefully it will be seen that it could not be successfully disowned by the proudest of its many relatives.